Kegco's HBK163B-3 Triple Faucet Homebrew Kegerator allows you to tap a choice of beers. 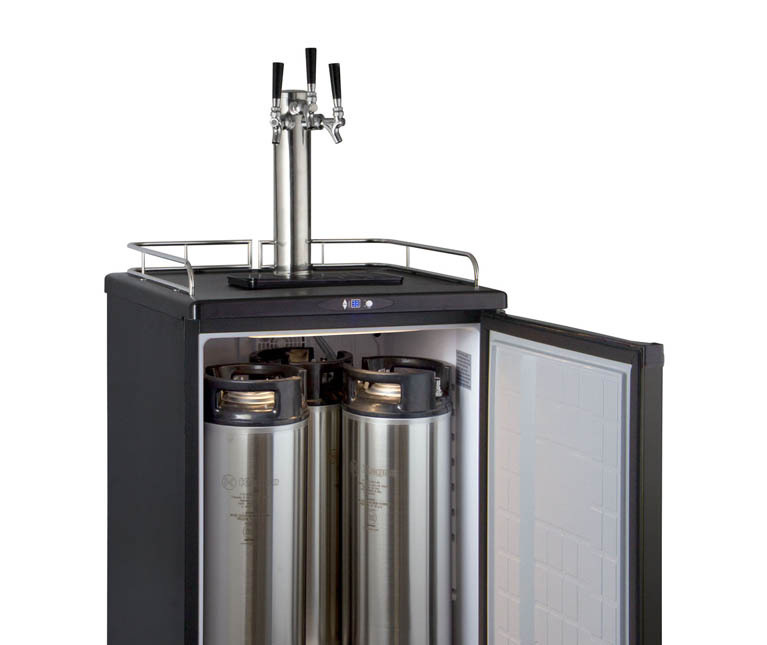 Whether you are dispensing brews in commercial or residential settings, this home brew keg cooler is quiet enough for use in your kitchen or man cave, yet durable enough to withstand frequent use in pubs and breweries. The freestanding homebrew keg dispenser has a sleek matte black cabinet with a matching reversible door. The HBK163B-3 comes equipped with useful features like a dishwasher safe drip tray, a three-sided chrome guard rail, and lockable rolling casters for ease of mobility. The cabinet is an expansive 5.8 cu.ft. and large enough to hold one full size, pony, or quarter slim keg, two 5 gallon commercial kegs, three ball lock kegs, or two pin lock kegs. When used to ferment beer, it can hold a 6 gallon bucket or carboy. 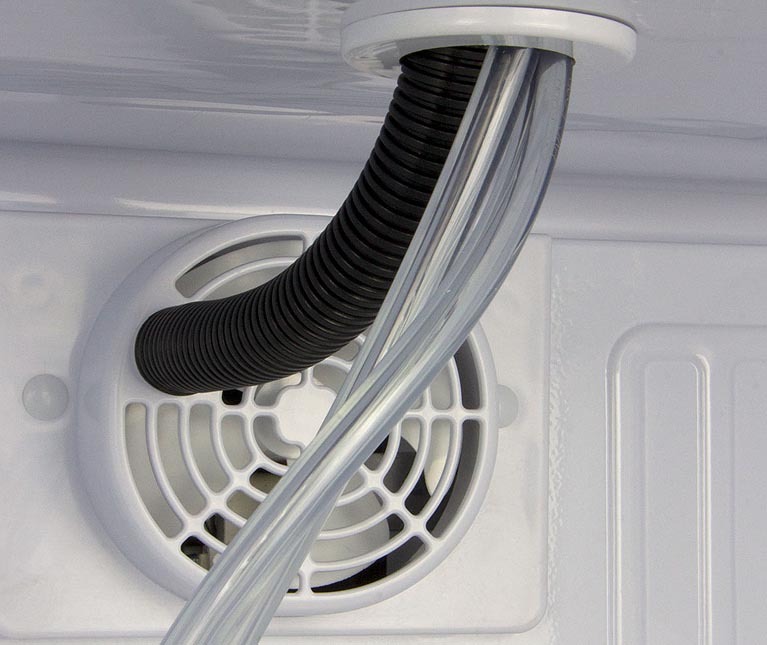 A cabinet floor mat made of steel evenly distributes keg weight for increased interior stability when dispensing multiple ball lock kegs through your triple faucet tower. This home brew kegerator can also be turned into a regular all-refrigerator by using the three included wire shelves. The incredibly wide temperature range of the HBK163B-3 can be set as low as 32 degrees Fahrenheit for dispensing and as high as 75 degrees for fermentation. Fan forced cooling circulates chilled air evenly through the interior to maintain optimal beverage conditions, and the air-cooled triple faucet draft tower ensures your beer will be as refreshing as possible when poured. 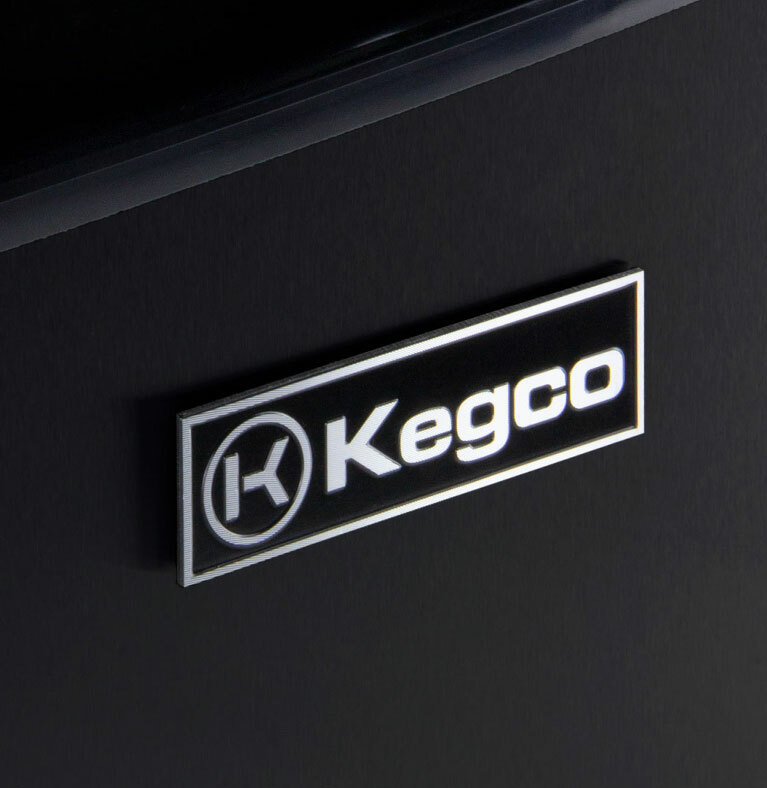 This homebrew keg refrigerator includes Kegco's Exclusive Home Brew Dispense Kit, which provides everything you need to dispense three Cornelius home brew kegs, including three complete sets of ball lock keg couplers.